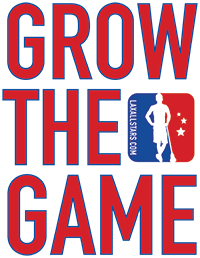 Editor’s note: Lax All Stars was a proud sponsor of the World Indoor Lacrosse Championships in Prague this year, and we asked sports broadcaster Andy McNamara to help us cover the event. Andy was onsite commentating during the live webcasts, and he’s provided some great updates to LAS Readers over the past few days. Now it’s time to wrap it all up! The 3rd FIL World Indoor Lacrosse Championships is officially in the books and the top three nations stay the same as the previous two tournaments. Prague, Czech Republic played the role of host exceptionally well and showcased the country’s passion for box lacrosse. Countless volunteer man hours went into pulling together the WILC and their efforts should be commended. Below are the final standings and briefings on how each of the eight participating countries wrapped up. The big bad red and white attack flew into these championships as the favourites and head home for the third straight time with gold draped around their necks. With the motto of “playing to win, not playing to defend”, Canada went undefeated the whole way to improve overall to a perfect 17-0 on the world indoor lacrosse stage. Having a top to bottom line-up of all-stars, which saw vicious defensemen, a crisp transition group, and highlight reel scorers blend together into a cohesive unit, displayed what a beautiful game this really is. There simply was no exploited weakness. The one iffy factor entering the tournament was that Team Canada had no pure faceoff specialist. Mr. Pat Merrill of the Toronto Rock put that fear to bed early as he proved to be more than adequate off the draw. The Canucks were pressed in the opening halves by both America and Iroquois, however, they always met the final buzzer in a comfortable position. Defeating their two greatest challengers in USA (15-10) and Iroquois (13-6) showed that clearly. Captain Colin Doyle ended the WILC as second overall point getter, in the company of Dan Dawson and the ageless John Grant Jr. on the leader board. Matt Vinc got the nod in net for the semi-final and gold medal matches, receiving game MVP honours in Saturday’s finale. Despite their considerable talent advantage, the developing lacrosse nations who scrimmaged or squared off against the Canadians were all incredibly grateful for the learning opportunities gained from live competition. One of the main purposes of the WILC is to grow the game across the globe, and the more lessons other countries can take away from facing the likes of Canada to bring back to their local programs the better. The creators of lacrosse overcame complicated international passport issues to make it to Prague and put in all that effort for one reason…to finally conquer Canada. Coming within a whisker of gold in Halifax, Nova Scotia four years prior in a 14-13 overtime loss to the Canadians, Iroquois Nationals felt they had the total package in this WILC. They were tested in round-robin play, narrowly edging the USA by a single goal to win Group B and get a pass to the semis. After getting through Czech Republic the world anxiously awaited for Canada vs. Iroquois part three. An unfortunate multi-player collision into starting goaltender Mike Thompson during the opening quarter sent him to the locker room with a left leg injury. Initially the Iroquois rallied around backup and Buffalo Bandit Angus Goodleaf. He stood tall, making several spectacular stops, before the relentless Canadian forces broke down the doors. Team Canada scored six unanswered goals easily scooting around a surprisingly flat footed defence. Top faceoff man Thomas Francis was specifically burned on four of those scores. Iroquois pressed, but try as they might were never realistically back in the contest. Deeply disappointed, but always dangerous, the Iroquois will surely contend for a medal at the next world championships. On paper the United States was sending their best ever indoor box team to compete in the worlds. 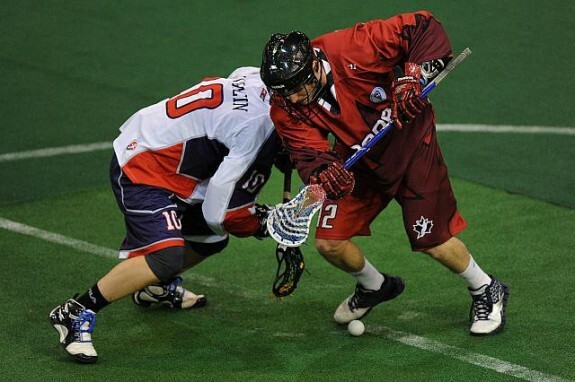 Casey Powell and Paul Rabil were only a pair of the vast offensive arsenal that the Americans had at their disposal. The only question was in goal. Veteran Erik Miller had been out of high level competition for a couple of years, while Jason Henhawk is a developing star that lacked big game exposure. Following a bitter 11-10 defeat to the Iroquois, USA trumped Australia 28-2. The highly anticipated U.S. versus Canada semi-final saw all the expected intensity early on, before defensive breakdowns and goaltending switches had Canada collect a berth into the finals to the tune of 15-10. The disappointment of not getting to play for the top prize is perhaps what allowed the Czech team to score first and keep the contest much closer then the Americans would have wanted. Spurred on by seasoned Head Coach Tom Ryan, the United States dominated the last fifteen minutes and should hold their heads high wearing bronze back home. This Czech club was the feel good Cinderella story of thE tournament. Finishing 7th in 2007, the coaching staff, led by North American lacrosse great Jim Veltman, moulded this group into a well oiled machine that mixed a relentless work ethic with sturdy technique. Each game showed the lessons learned from the previous and surprising Ireland to advance to the playoff rounds had the host crowd already applauding their squad’s improvement. Then came the Thursday night quarter-final match against England; a nation that had stymied them by one goal in the ’07 WILC as well as edging them in field lacrosse. A 12-7 well executed sixty minutes later and to the delight of the wild arena crowd it was the Czech Republic going to the semi finals. There the Czechs hung around with Iroquois for two quarters before the now three-time silver medalists opened up and took the ‘W’ 19-6. This was all gravy as they still got to compete for a bronze medal. The home team gave the Americans fits for three quarters and looked like for a moment they could do the impossible. However, the star studded USA stepped up when needed to win the bronze. This sensational world standing upgrade in only four years will surely boost interest of indoor lacrosse to the country and we very well may see Czech Republic with medals around their necks in the next WILC. England came into the 2011 WILC with thoughts of no less than a bronze medal. The result for Head Coach Chris Hall and his crew was frustration and disappointment. With the monumental upset described above, Team England’s main focus for four years from now has to be on defence. With National Lacrosse League or professional experienced players at forward and in goal it was the young defenders who proved to be their undoing. The good news is that those club level English players on ‘D’ all have excellent takeaways from battling the gold medal Canadians and being in a world tournament. Come 2015, the English will definitely be back in the medal hunt. It wasn’t all doom and gloom as the national club did go 2-1 in Group A matches as well as dismantling rival Australia 23-8 in the playoff contest to lock up 5th. In addition, Tom Johnson of the Washington Stealth led all scorers over the eight days at an impressive total of 31 points. The team from down under remain in the same 6th slot as in 2007. Coming to Prague with a four or five finish in mind, Australia never seemed to get on track and going with a more veteran line-up made them look sluggish at times. Jeff Joy and Tim Fry were standouts on offence as both forwards showed the speed and aggressiveness that will surely make them a focal point of the national club come 2015. In a 26-2 round-robin defeat to Canada, the Aussies soaked in a wealth of playing knowledge. They specifically improved on their pick and roll defence when facing Slovakia in the last day of Group A play, which secured them a win and the chance to square off with their commonwealth rival, England, in the playoffs. Ireland improves one spot in the world standings at this WILC and although they were gunning for a 5th or 6th place finish still valued the usefulness of this event. “We were in a tough pool with USA and Iroquois, but did learn a lot from their great play,” explained Irish player and Chairman of the Ireland Lacrosse League, Paddy O’Leary. “We expected a better game out of ourselves against Czech Republic in the round-robin. It is good for lacrosse in Europe though to see how fast the Czech club has improved in four years.” Team Ireland did secure their first ever WILC victory, coming 12-7 versus Slovakia, and strong efforts by Kevin Owens, Joe Caulfield, and Connor Walsh provides a good foundation to build on. The popularity of field lacrosse is growing on the emerald isle, which box players’ hope translates into more participants for the indoor game. learn something new each time,” said Slovak goaltender Stanislav Mraz. “We got better in every part of our game. We have been missing a lot of basic lacrosse knowledge and I believe that we are now a different team and have a solid base to build on,” he concluded. Slovakia split the two matches with Ireland as the Irish took game one 12-7 and Slovaks bounced back Friday 10-7. *On a personal note, it was an honour to be chosen to do the play-by-play broadcasts for this prestigious event and get to watch the greatest players in the world do what they do best. A special thank you to organizer Petr Chmelar who went above and beyond in being a gracious host, and of course to Lacrosse All-Stars for being a key tournament sponsor. Andy McNamara is a Toronto area sports broadcaster and writer. He is the Play-by-Play voice for the Toronto Rock on the National Lacrosse League Network and for the 2011 World Indoor Lacrosse Championships. Contact at andymcnamara@hotmail.com, or follow on Twitter @AndyMc8. CLICK HERE for more photos in the LAS Facebook Gallery! Hey Thailand Lacrosse, Here We Come!